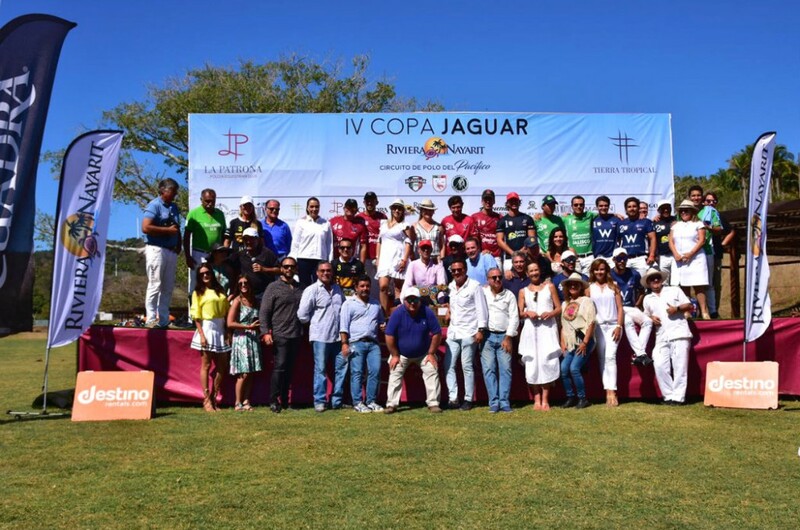 The Steta Cuadra-Destino Team took home the IV Jaguar-Riviera Nayarit Cup, which was played from April 5-8 at La Patrona Polo & Equestrian Club. At the end of a very intense match the Steta Cuadro-Destino Polo Team was declared the winner of the IV Jaguar-Riviera Nayarit Cup as well as the best team on the 1st Pacific Polo Circuit, which ended this past April 8th at La Patrona Polo & Equestrian Club in San Francisco, Nayarit. This tournament also marks the end of the official polo season at La Patrona, which began in October 2017, though there will still be exhibition games held during the Sunday Polo Brunch for the rest of April. 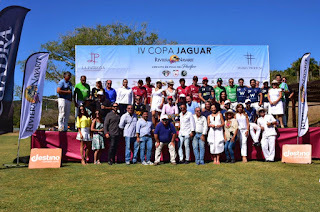 The IV Jaguar-Riviera Nayarit Cup is part of the 1st Pacific Polo Circuit that also included the 19th Agua Alta Cup, played from March 23rd through April 1st at the Costa Careyes Polo Club with excellent results and the participation of personalities with great experience in the world of polo. They included Billy Steta, President of the Mexican Federation of Polo (FMP); Valerio Aguilar, recognized as one of the top polo players in Mexico; and Alberto Ardissone, creator of the Agua Alta Cup. Guillermo Steta, President of the FMP, recognized the efforts of the organizers of the 1st Pacific Polo Circuit, which began as Alberto Ardissone and Giorgio Brignone’s dream, who were soon joined by enthusiastic followers. 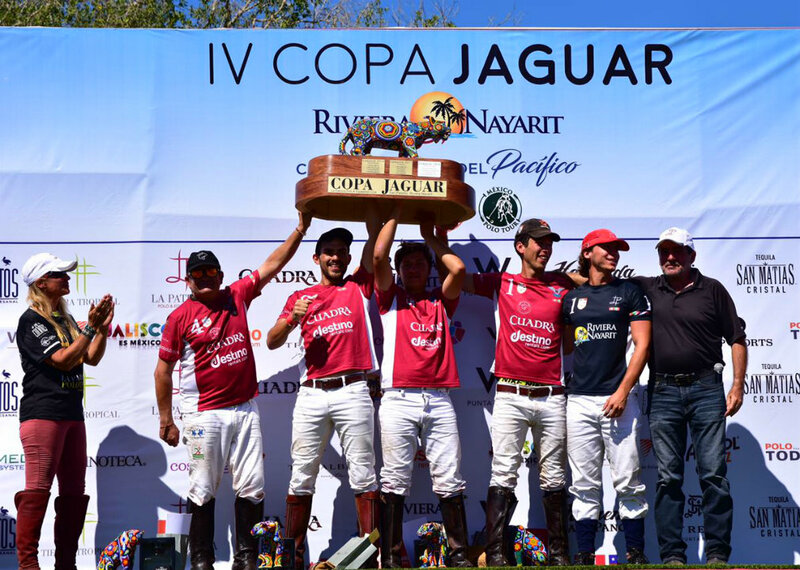 The lineup led by Guillermo “Billy” Steta, President of the Mexican Polo Federation, beat the Costeñita-W Punta de Mita team with a final score of 12 goals to 10 in the last minutes of the match to take home the cup. The Steta team, comprised of Guillermo Steta, Erik Barba, Benito Hernández, and Andrés González Gracida recovered from a setback during the first period, tying the scoreboard at five in the second chukker. By the middle of the match in the third chukker, the Costeñito Polo Team took the lead with a score of 7 goals over 6, with great plays by Guatemalan Aycinena and Victor Setién. During the last two chukkers the two youngest players on the team, Benito Hernández and Andrés González Gracida—backed by Erik Barba and “Billy” Steta—were able to turn it around and finished the play with a score of 12 to 10 in their favor. With their 10 goals the Costeñito-W Punta de Mita team, comprised of Víctor Setién, Sebastián Aycinena, Rodolfo Ramos and Juan Pablo Gallegos, highlighted the excellent quality of the tournament—and this last duel was no exception. The Agua Alta-Hacienda San Pancho team of Roberto González Gracida, Manuel Matos, Diego González and Memo Jiménez came in third after beating La Patrona-Riviera Nayarit’s Tommy Elliot, Alexis Cruz Echeverría, Juan Carlos Galán and Adrián García with 8 goals to their 3. Among those attending the award ceremony was Jaime Cuevas Tello, Municipal President for the Bahía de Banderas, who commented on their commitment to ensure polo becomes a part of the Riviera Nayarit and drive this activity in the region. Meanwhile, Rubén Carrillo Fabila, Managing Director of Tierra Tropical and La Patrona Polo & Equestrian Club, expressed his pride at hosting some of the top personalities in polo at La Patrona, along with representatives from the tourism sector and government; he also stated his commitment to continue to collaborate with the best allies for their mutual benefit. Likewise, Silvia Duarte, Groups and Events Manager for the Riviera Nayarit, commented how pleased she was to have accomplished the dream of completing the Circuit, and thanked the media for their diffusion, congratulated the winners, and invited everyone to continue enjoying the facilities and the event. Other personalities attending the event included Guillermo Steta, President of the Mexican Polo Federation; Alberto Ardissone, Founder of the Careyes Agua Alta Cup; Giorgio Brignone, President and Owner of the Costa Careyes Polo Club, and James Hughes, General Manager of the St. Regis Punta Mita, among others. The winning team took home prizes from St. Regis Punta Mita, Hotel Hacienda San Pancho, Destino Rentals, Botas Cuadra, Pulseras Marín, Tresalba Joyería Ecuestre, Tequila San Matías, and Aperol Spritz, as well as trophies that were works of Huichol art from the Riviera Nayarit. There was also a prize for the best mare in the tournament, “Chiquita,” owned by Víctor Setién and ridden by Guatemala’s Sebastián Aycinena. The awards ceremony featured live mariachi music, and of course, the recognition of the attendees.